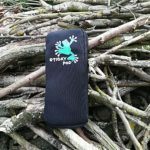 Review: Sticky Pod - cycle jersey pocket phone and tool pouch ADVNTR. For anyone unfamiliar with Sticky Pods, they are a basically a zip up, neoprene pouch. Useful for keeping all the things you usually stuff into your shirt pockets, in one place. They come in three sizes…mini, small and large. I have been using the small version of the sticky pod for a few years now. Apart from the tag on the zip breaking (more about that later) it has stood the test of time and remains in good condition. This review applies to the large version. The dimensions are an iPhone 7 Plus friendly – 10”x4.25” inches. Well that’s what the American manufacturer Miles-Wide call them. 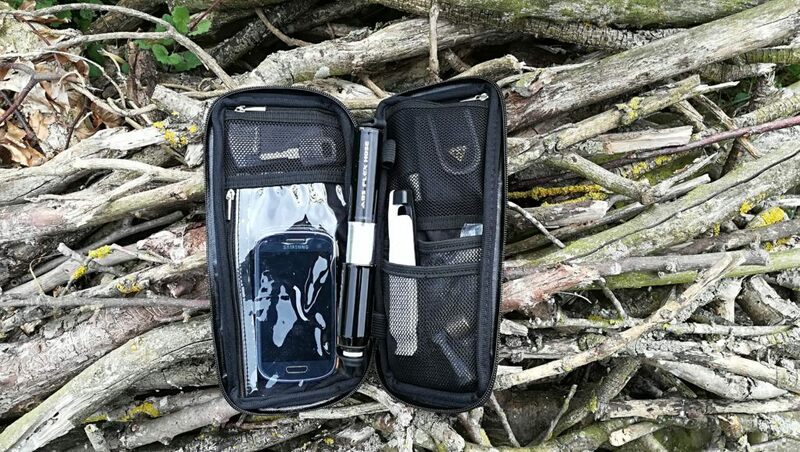 Load up the large utility pack with spare tubes, CO2 cartridges, multi-tools, patch kits, ID, cash and cards and still have plenty of space left over for energy gels, chews and GU’s. The actual utility pack is lightweight and only adds a few grams to the total load. Added benefits are the tools and other stuff won’t poke you in the back, rip expensive jerseys or cause bodily harm in the event of an accident. The pouch is water resistant. I am not sure whether they are waterproof but my old one has got pretty damp while everything inside has remained dry. I usually pack stuff in zip lock bags if it is going to be wet…just to be on the safe side. There is a new and improved phone compartment within the pouch. 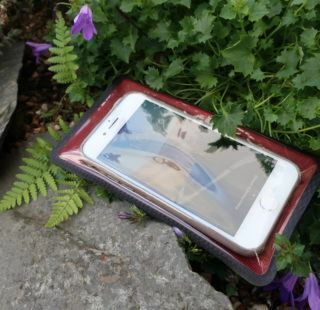 You can still operate your phone through the clear plastic so there’s no need to get it out in the rain. As the marketing blurb says, the pack itself is pretty light. It is what you put in it that adds up! On my first run through I tried to cram everything I had into it but decided to be sensible in the end. There are two loops to hold your pump but my Lezyne Pressure Drive didn’t want to go in. I am sure I could have persuaded it in the end but life’s too short. 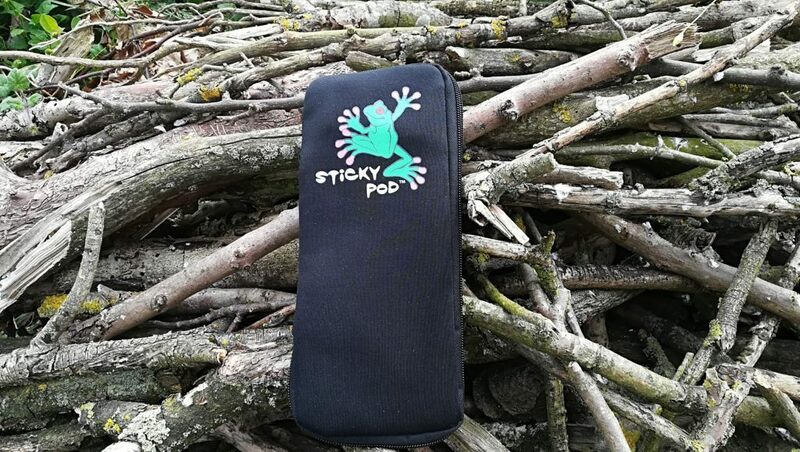 The Large Sticky Pod has plenty of room for your phone and tools. 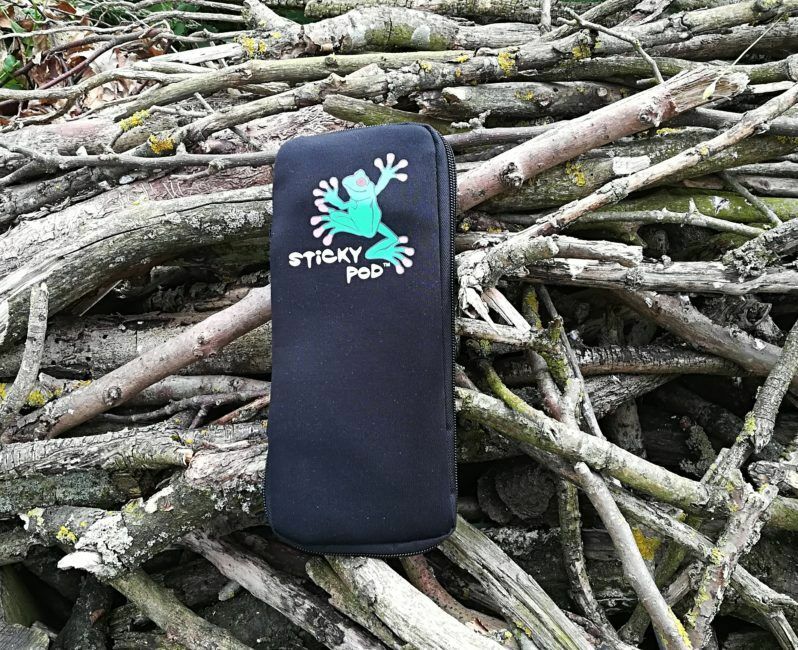 I have been using the small version of the Sticky Pod for a few years now. Outwardly it is in pretty good condition. On more than one occasion it has gone skidding across cafe floors, the drive, the patio etc but the neoprene is still as good as new. The zip is reinforced with a rubberised strip. I guess this keeps water at bay. Well, in a cold and dark fumble a couple of years ago, I managed to tear it. I was not being particularly sympathetic with it at the time so put it down to user error! The tag on the zip broke and has been replaced with a zip tie loop. Once again, it was my fault. I tried to cram far too much into it and tried to force the zip shut. It didn’t work. Had I not rated the small Sticky Pod, I would not have bought the larger one. As long as it stays in my pocket, this is a firm recommendation! I bought this online from Gone Biking Mad who are based down in Dorset. Cost was £19.99 delivered. Keep all your stuff in one pocket! It can be tempting to cram too much in!